Terry Hopkins‘ dad’s box of General Sign Company signs coughed up this billboard of Rusty, Rueseler’s Chevrolet’s mascot along with the “Rueseler’s are as Wild as the West Rest!” slogan. 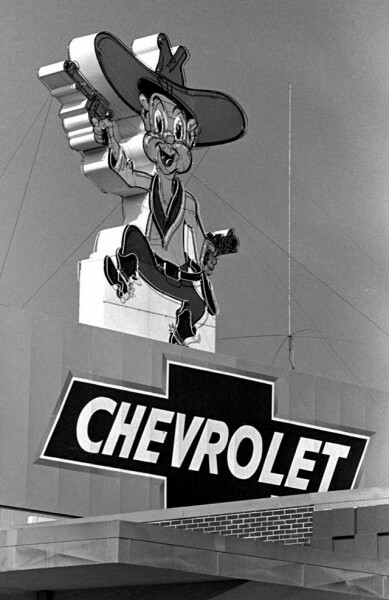 A neon version of Rusty graced the top of the dealership on South Kingshighway. Here’s a link to more photos and the story. It has a bunch of comments from folks who remember buying muscle cars there, and a note from someone who knows what happened to the big sign. 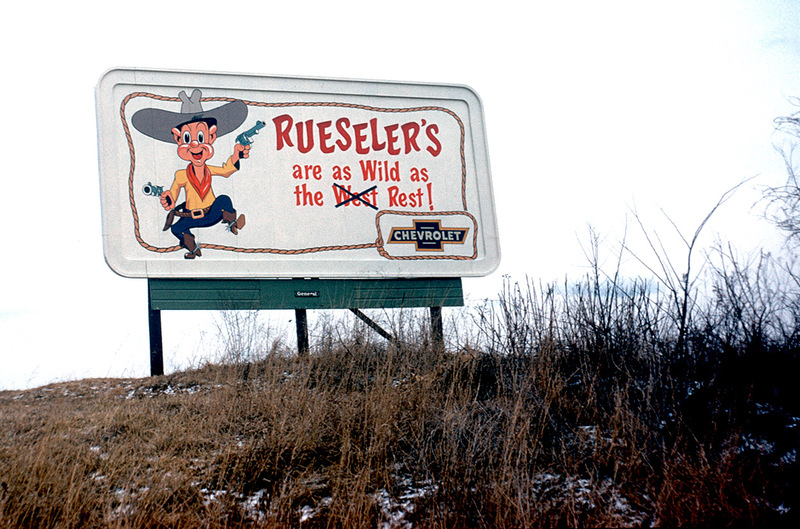 The Rueseler family was indeed a really nice family. When I managed the Quick Shop on N. Kingshighway in late ’67-late ’69 the family members where regular customers at the store. Rob was just a young boy and he would ride his bicycle to the Quick Shop to buy snacks and read comic looks just like all of the neighborhood kids did. Rob’s parents both worked at the dealership all week and he had lunch that the housekeeper prepared and he just loved to get out on his bicycle and ride down to the store and hang out. One Friday morning Mr. Rueseler stopped by the store and asked me to join the family at the dealship on Saturday morning for the dealership meeting because I was like one of the family. I felt pleased to be invited but had no idea what a nice surprise awaited me. We all gathered around the big conference room table for donuts and sweet rolls. After a few minutes of dealership talk, Mr. Rueseler said, “we have a special guest with us today who has been so nice and kind to our son Rob and we want to do something very nice for her. That little yellow ’65 Corvair convertible outside is hers and we want to say thank you to her by letting her have the keys to that red super sport Chevelle ’69 for the weekend. It is all fueled up and ready to go. We will put her Corvair inside for the weekend and take it back to the Quick Shop on Monday morning so she won’t miss work. Enjoy it Lois, we love you and trust you to take good care of it. Thanks again for being so nice to our family.” I was in tears of joy! Getting into the Chevelle from the Corvair was like getting out of a pedal car and into an Indy car. My parents couldn’t believe it when I pulled up in their driveway. My memories of the Rueseler family are great! I wholeheartedly concur with Lois Seabaugh and the story doesn’t surprise me. We were close friends of the Rueseler family and son John and I go all the way back to kindergarten at Campus School. We both ended up as lawyers, even being housemates our final year in law school at MU. Vicky, John, Cathy and Rob are all good souls and I send them good tidings. Lois’ story is just plain cool. Makes me smile. A great story…I had no idea of the Rueseler story with giving away a car. Very nice deed for a family in Cape to do or a nice deed from anywhere. Sounds like the family lived up to the name…”Nicer than the rest”. 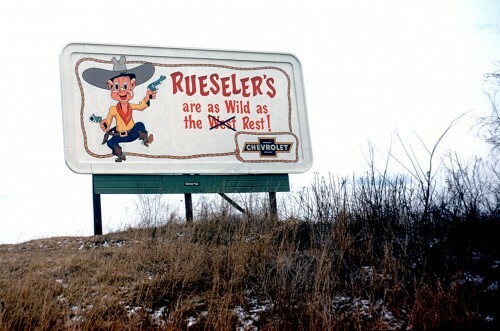 Truth be told, few of the rest could match some of the Rueselers.